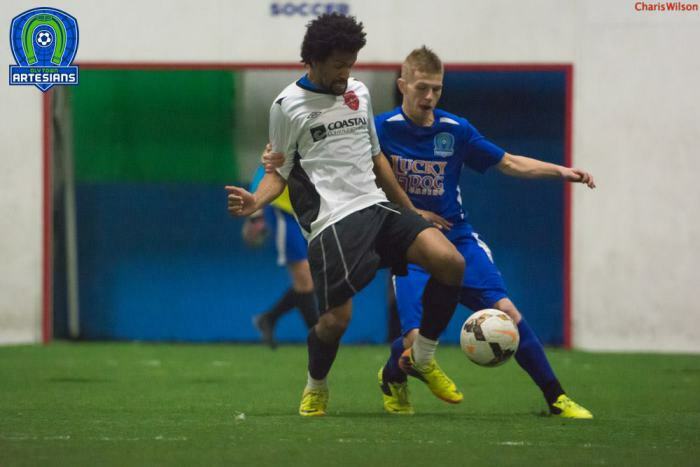 Four Oly Town Artesians were named co-Players of the Week by the Western Indoor Soccer League on Tuesday. JC Henson, Issa Hassan, Sebastian Lyons (pictured above) and William Ramirez each scored two goals in the Artesians 9-7 win over the Arlington Aviators. The Aviators’ Aaron Burns was also named co-POTW for his hat trick against the Artesians. You could look at both sides of the ball last Saturday night at Olympia Indoor Soccer and find players doing special things. For the Arlington Aviators Aaron Burns scored a hat trick to raise his goal total to 9 on the season, pushing him into a tie for 3rd-best in the league. For the Oly Town Artesians it was a group of guys that each had a brace (two goals) that lifted the home side to a 9-7 win. Burns and Issa Hassan, JC Henson, Sebastian Lyons and William Ramirez are the last WISL Players of the Week for the 2014-15 regular season.